What’s the Fed Trying to Say? My fancy-schmancy Fed Hawk-o-Meter jumped 18% from 22 to 26, after having been on a downtrend for four Fed meetings in a row. Something’s up. The average frequency per meeting minutes of “strong,” “strongly,” and “stronger” between January 2013 and December 2017 was 8.7 times. The 26 mentions in the March-meeting minutes were 226% the pre-redline average. The 18% jump in the March minutes from the January minutes is particularly striking because the Fed had spent the prior four meetings backing off ever so gingerly its bullish assessment of the economy. But in March, the direction changed. Yet the reading still hasn’t jumped back to the peak levels of last August, when the Fed, with the economy running red hot, was telling the markets that it would raise rates four times in the year. In the January-meeting minutes, there were three references about the pace having “moderated,” such as, “Growth of business fixed investment had moderated from its rapid pace earlier last year.” Those references to anything having “moderated” have disappeared. “Patient” was introduced with one mention in the December-meeting minutes: “The Committee could afford to be patient about further policy firming.” In the January-meeting minutes, “patient” was escalated to a cacophonous 13 mentions. It was all over the minutes in mind-numbing repetition. But in the March-meeting minutes, “patient” was harshly slashed to just seven mentions. That’s a 46% reduction! And the potential end of “patient” gets escalated. These two mentions of the potential end of “patient” was an escalation of just one such mention in the January meeting minutes. It seems, according to my fancy-schmancy Fed Hawk-o-Meter, the March-meeting minutes have a message for the markets: The Fed is back-pedaling its over-reaction to the December market turmoil, now that markets have become euphoric all over again and that credit has become super-easy again. ← How Big or Tiny of an Apartment Can the Median Household Income Afford to Rent in the 100 Largest US Cities? From reactive to hyper-reactive. The long end of the curve puts pressure on banks who stop lending (thus creating a mini credit squeeze and short term rates rise – yc inverts from the middle?) At 3 1/2% FFR we implode. Now that stocks are back to all time highs the fed wants to curb enthusiasm. Totally agree! Likely, this form of analysis is ignored by the algorithm-robots. Wonder if words like frothy and exuberance would add extra bonus points to the meter? I think you’d be shocked at how advanced the algos have become at parsing Fed speak or company releases. I think the Fed is embarrassed at the sudden reversal of its perfectly normal normalization attempts and its retraction of its so called forward guidance. Like an alcoholic who has suffered ‘a slip’ it wants to rediscover sobriety. It may have helped them that Larry Kudlow asked for a .5 % cut in rates. all because the most expensive stock market since 1929 gave back a few percent. This was so ridiculous that the source, and his employer can now be discounted entirely. The remarks of Rex Tillerson come to mind. I don’t understand how this farce continues. If regular people understood what is going on I feel they would be out with pitchforks but finance is so shrouded in mystery to most people and they all think “some really smart people are figuring it out”. The hypocrisy is mind numbing though … how can they keep saying that the economy is “strong” but we still need to implement life support measures. We all knew this was a bad idea that would do nothing but spend our money to inflate the markets and leave us in a no win situation where they can’t withdraw without crashing things down. Now they say “well you don’t want the market to crash do you?” … but no one every owns up to the fact that the market has no business being where it is right now. It deserved a 50% adjustment before the Trump rally. It’s shocking and obscene that we are not only considering ending the normalization process after it was implemented about 7 years too long …. but are talking about throwing gas on the fire!?!!?! Ugh, … and I don’t doubt for one minute that the morons in charge now have asked about if they can buy stocks like Japan does….. I suspect they are already doing it. Maybe buybacks overwhelming the market can do this but it just seems to come in at the known inflection points and then rally indiscriminately in a way no legitimate trader would operate. Interesting piece on Politico (April 11) : ‘Is the Fed in retreat?’ about its weakening of the bank stress tests. By Tim Clark a career bank examiner. Looking at the individual economic sectors that “strong” appears, they “appear” to be anything but “strong”, according to the fundamentals. Quite the contrary, they appear to be weak to weaker and weakest! eg: “Credit card loan growth remained strong”. With no mention of the amount of loans in arrears and defaults, which remain “strong” and appear to be getting “stronger”. It seems the Fed interjects “strong” into any category that “appear” to be weak or weaker. All in an effort to fend off any air of impending economic problems, such as falling asset prices. The Fed can’t have that! Hence their; “Asset valuations had recovered strongly”. Again with no mention of causation. eg: share buybacks or the converse, the falling market “darling’s” FAANGS stocks. Lumber Futures: $480 this time last year, $438 Feb this year, $343 today, and it is Spring. Whatever the Fed is using as a yardstick, they will always be lagging. Lots of signs of a weakening economy. Well, if you look at a long-term chart, lumber futures are now down all the way to…the high end of normal after a huge ludicrous spike that got unwound. Should start to see layoffs where I live, but ‘fibre’ is still sky high. Red cedar, $200+ per cubic metre. When I can get old growth yellow cedar lumber for $1.00 fbm I’ll stock up big time. Right now I’m paying $1.75 from a buddy who owns a mill and that’s a deal in today’s market. Prices not showing any signs of decline and logging is booming. Booming. When layoffs start I’ll be sure to let fellow readers know as that is one of the first indicators. The first casualty is the move to high grading, then they lay off falling crews. Then, they get the stuff off the ground asap. A very lonely sight is the last boom leaving and an empty cleaned up dryland sort. I have seen them sit empty for years. There are Trump tariffs averaging about 20% on Canadian lumber. Ding Ding Ding IMO here is the winner. We CONtinue to have a pretty narrow field of winners in the Stock Market. Volume is pretty punk and its really the derivatives fueling the leveraged gains. Its a casino and for now it is working for the usual players. In the real world it feels soft real estate is slow in the markets that are heavily hyped and for sale signs abundant in up in middle and above real estate. I’m a food guy been in chain sales in grocery as well as food service to National accounts for Commodity Analysis, Product Development, and Sales. Everyone has to eat but trading down is as strong as its been in a long time. Heavy merchandising on branded goods at deep discounts are as common as I have seen them to drive traffic. Portion sizes continue to shrink in most food service chains. Protein prices (meat, poultry, seafood) are weak/static in spite of static to down supplies. Again featuring is at prices that are lower than past recessions. Even with lower prices trading down is apparent. Sure income growth has slowed but not the debt load. IMO that’s the reason credit card growth is in hyper drive. My lord when is that bubble going to blow? How can they keep issuing them to folks with massive credit card debt? I think its really got a lot of the CONsumers by the throat. To those that cry about a shortage of workers I reference a note from a week ago. The armed forces indicate that only ~30% of potential recruits can pass the initial tests for enlistment. The other ~70% failed due to obesity, lack of education, or drug tests. One or more of those. When you are stripping that many out of the labor force no wonder we keep hearing employers complaining. I think even the Feds talk out of both sides of their mouth on that with what ~ 95 million out of the workforce. Its a cluster I see the stock market like I see the PM markets its ebb and flow is just the banksters going long or short and harvesting the honest folk trying to save some money. After all they can’t make anything in interest. I tend to agree with those that espouse we are watching the middle class on a crash course to extinction. I don’t see any positive momentums just shuck, jive and obfuscation. Remember folks all this hullabaloo was triggered by a quarter point increase. Once again I’m assuming wall street believed easy (free) money was the natural way of life. I think i have commented before that the fed will hike above S&P 3000 and cut when it drops below 2500. Other than that, you are welcome to anything else the FOMC meeting minutes say. This ZIRP malarkey has been going on for nearly a decade now, which means that there are a lot of 30-something or younger financial analysts and whiz kids out there that have never experienced a period of seriously rising interest rates, let alone a real credit squeeze. And the economic history books aren’t going to be much use to them either – nobody in the past would have been crazy enough to propose, let alone implement, a policy of negative interest rates. Except for about five years between 2003 and 2008, the Fed has kept ZIRP in force throughout the 21st Century. Great stuff, Wolf. I think FOMC/FRB is embarrassed how over-reactive their Jan 2019 back-pedaling was, and when Wall St went crazy up as a result, it became necessary to back-pedal the back-pedal. But did Wall St understand the message today? Also wondering about the word statistics for the press releases versus the more verbose minutes. Can you send the press releases for Jan and Mar through the hawk-o-meter also and check whether they correlate with the minutes? Just wait when Trump appoints Sara Palin to Fed. Maybe even Fed Chairman. Might need some new and different works for the Fancy Schmancy Hark-O-Meter. “I can see Russia from my house”, making her sound like an international trade expert in this current administration. =>What’s the Fed Trying to Say? They’re trying to signal to the rich that they can party on, in such a way as exclude the undeserving masses. Socialism for the rich: good. Socialism for everybody else: bad. All state and federal policies are like that because voters are so easily suckered. They don’t try to “signal”. The people who matter most already know. And the people who matter most will decide whether they are ready for socialism or not. It does not matter what the game is, they decide when to play and then dicate the rules. All the rest is just details. Aren’t floating abstractions fun? But back to reality, a guy from Venezuela was helping me with my ISP connection recently. I asked him if he still had family in his homeland and he started to tear up – I did as well. The fed has been doing everything it can to keep bankers rich since it’s inception, nothing has changed with them. The only interesting trends I see are the millennials embracing digital cash, while simultaneously rejecting the debt culture they are ensnared in through the student loan trap. Some are opting out of the conventional jobs economy altogether. When I searched for info on this trend, I found the emphasis in the media was on farming, but in my experience here in Appalachia, my young new compatriots, while they do “farm” in a limited way, mostly work on the internet. In Canada, anyone entering Trades has a job to go to. If not, something is wrong with the applicant or the chosen field. You might have to move, but there are jobs. I have been retired for almost 7 years and still get offered work. My son holds down a full time job in the oil patch and also runs his company back home. They have lots of work lined up. My brother-in-law has been helping their builder build his new house to lower the principal and reduce the builders loan. He is a very good worker and easy to get along with so he was offered a job with the general as a starting 1st year carpenter apprentice, $25 per hour. He took it. Age 45. I have never heard of an apprentice that old. (I was 17). They have at least a years work booked. the economy has been picking up in the 2nd quarter for the last few years after weak 4th and 1st quarters. We’ll see if that trend continues. I think the real key will be this fall. The very low interest rates have really hurt state pension systems; especially, Kentucky, Illinois and NJ. Can you imagine if equity markets also dumped? 2. Require employees to pay more into their pension funds. Since most of these pensions will be paid out to currently retired or soon to be retired workers, the onus would be almost entirely on newer and younger workers. Contracts already require newer workers to make greater contributions .To demand even more from these newer workers is a complete non starter. 4. Court rulings allowing states and localities to reduce their obligations. This has failed so far and is very unlikely to succeed in the future. The Federal government will assume these obligations. Some Democrats have already suggested this.Obviously the politics of doing so are very volatile to say the least and has the remote possibility of starting another civil war. No need for the fed minutes. new construction is doing in our area. Demand, and lack of supply ( able bodied workers ). Of course we are fly over country. No east or west coast RE prices. I only wish I was 30 yrs younger. Great opportunities out there on main street. No 4yr degree with loans required to participate in it. My eldest son quit college and got “rich” renovating old houses and building a few new ones, to rent to local college medical students. A bit of irony there, don’t you think? We have all been conditioned as to the “tools” the Fed has in its toolbox. Interest rates, quantitative changes, and money printing are real tools, but apparently, via Fed minutes “chatter”, the economy responds to a simple rattling of the box itself. How quickly the Fed stops the rattling, when just the sound itself rattles the real economic numbers. I would rather listen occasional rattling, than have them open the box and take out a tool that may cause more harm than good. Wolf, keep up the good work with the Rattle, I mean, Hawk-O-Meter. There used to be a labor movement in the U.S. called “The Wobblies”. Maybe the title should now be applied to a capitalist institution: The Fed. Isn’t there some old observation on the economy that says ‘as soon as a metric is seen to work it doesn’t’? If people started believing in the hawkometer, the fed would use different words…..
Or the other way around? Is the Fed is using the hawk-o-meter as part of its “communication tools?” The Fed always tries to let the markets know where it is going so that by about 60-30 days before the next move, there are no surprises. 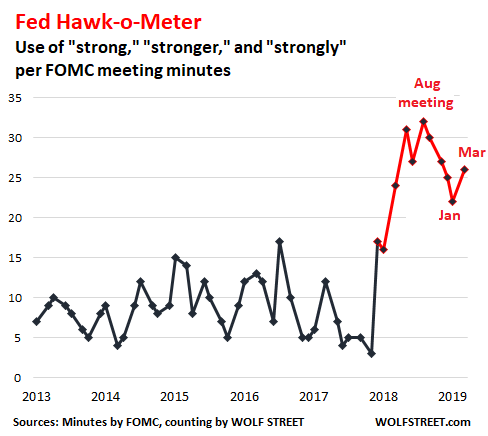 If this is the case, the Fed would carefully calibrate the words in the minutes to get the hawk-o-meter to reflect what it is trying to communicate. I call it “fancy-schmancy” because I don’t want people to take the hawk-o-meter too seriously. Tongue-in-cheek is good. The Fed will let the economy cruise along in 2019 and then stick the knife in it just in time to destroy Trump’s re-election. Rates will start increasing in January and by election day, we’ll be in a recession. I don’t know and don’t care about politics, but chances are the US Federal Reserve will really do nothing more than talk talk talk for quite a while. And why should they bother when the monetary cranks in Asia and Europe are performing true feats of dialectic and monetary acrobatics to frontrun some more future growth right now? How much liquidity has the People’s Bank of China already injected in their financial system since the Lunar New Year? And that’s without taking into account the rest of the financial creativity such as cutting reserve rate requirements, cutting short-term interest rates, extending National Team operations the HKSE etc. All China has to show for it is a highly suspicious jump in PMI. The National Bureau of Statictics and Caixin will have to a lot better this time around. And what about Europe? Draghi continues his little show, pretending to have some sort monetary doomsday device hiding in the Eurotower basement ready to be unleashed at any moment. Perhaps he could start by explaing what TLTRO3 will be because so far nobody has a clue and the ECB remains suspiciously hazy on the matter. You see, why should the US Federal Reserve even bother when they can sit down on their couch, drink hot coffee, eat homemade pies and watch the best acrobatics this side of the Chinese State Circus? The FED currently has very little dry powder in store to weather the next financial crisis, unlike the ECB, PBOC, ETC who have a MASSIVE dry powder debt, they currently can not pay. So after the next SHTF splattering occours. Who will still be the cleanest dirty shirt?. Ultimately that is what it is currently all about. The Fed is taking copious notes and watching the Chinese stock market respond to the new debt stimulus this year. According to Jill Mislinski on 4/8/19, World Market Updates: Shanghai SSE up 61.62%; Hang Seng up 19.68%. If it works, everyone should do it. When is the harder question that the Fed and Trump are trying to figure out? Italy’s stock market is up even more, yet nobody is “taking notes”. I understand stocks are the most important thing in the multiverse and can only go up but if we take them as the sole measure of economic success by now Venezuela should be the wealthiest country this side of Zeta Reticuli. Look at the long-term charts. Shanghai is down 50% from where it was 12 years ago. Italy is down 60% from where it was 18 years ago, the Nikkei is down 50% from where it was 30 years ago, etc. Traders look at where stocks were yesterday or a month ago or a year ago. But to keep perspective about stocks, you need to compare them to their prior peak. The housing market is getting very strong. This is an important factor that should cause the FED to consider tightening policy. The Fed’s comments are as important for overseas readers as they are for Americans. Probably more so. So latest jawboning simply an indication that the Fed wants to maintain a stronger dollar. There will be no more interest rate hikes in 2019. Period. The bond market is signaling major weakness overall. And while you can find certain sectors doing well (e.g., Defense contracts LOL), everday US is seeing a slow grind downward. Not to put too fine a point on it, but the Fed appears to be trying to avoid saying much of anything at all. People might get the wrong idea and end up blaming them. They could adopt the common practice of the Delphic Oracle, which was to utter pronouncements which could be interpreted one way or its opposite, leaving them mostly off the hook for anything. It won’t matter once Herman Cain and Stephen Moore join the board. They won’t know what they’re talking about, but they’ll have plenty to say. The night is dark and full of terrors, but for now, twilight lingers. Are Herman and Steven criminals like the remainder of the FED board? Good one. Few even know who is on the FED BOG. They have always been appointed based on political connections and yet they are supposedly “independent”. Having someone on the BOG who has actually run a business? Imagine that. I watch for movement in the value of the U.S buck. on higher interest from a panicked Fed. The most important take away from these Fed messaging and signalling is that they CANNOT seriously NORMALIZE interest rates (let alone the size of their balance sheet) without destroying the market. More lala land coming. You are just witnessing the end of the Normalization Program, watch next month as the $15B cap begins and next September when the cap is $0. I know it’s too much to ask for but IMO some wage inflation would be a welcome break from the shenanigans of decades past. It can’t simply be delegated though, as the pendulum swings too and fro it has to come through natural processes. All that’s clear up to now is who the FED works for. Unless there is some miraculous reason to keep a large balance at the bank, one can simply link his or her bank account to Treasury Direct and invest as low as $100 in T bills earning at least 2.4% and have it back in 4 weeks. I only keep an absolute minimum of 30 day liquidity at the bank and the rest of my liquidity spread in Treasury Direct earning at least 2.4%. I adjust numbers as needed. Care to provide some guidance? Like do you need to open an account anywhere, any website where I can read more about the pros/cons, etc? Im one of the f*ck3d ones that cant buy a house on single income in the bay area, so have to keep my money at the Bankster institute. The good thing is the 15 cents Chase pays me every month keeps me from having to file another tax form. How many trillions have Americans lost to the banks in all the other aspects of the operation? It usually takes them years and years to reap spoils on that scale. Next time will be worse, at lot worse, but in the meantime the floodgates are wide open. Sounds like the Anacin headache has really gotten stronger. I wonder if Ka-Poor can alleviate the pain. And the expectation is for lower rates? How can rates go up when debt is teeter-tottering toward default? Currently eurobanks are taking it on the chin in terms of paying for the privilege of being a bank? I guess ECB’s next move will be bank relief through IOER or whatever the euro equiv will be called. Expecting an eurobank rally…. Relief across the board in terms of the outlook for Europe?